angry chicken: OMG, FOE is my new BFF! OMG, FOE is my new BFF! Before I switched to this, I actually made another casing variation using hem tape on the inside (instead of turning the fabric over) and then threaded the elastic through the casing made by the stitched hem tape. That worked, but then I was still threading the elastic. When I use FOE, it finishes the edges AND is the elastic all in one. Dig? It's awesome, and very unscientific. I trimmed the edges of the farbic where the elastic was to go because I wasn't folding it over twice anymore. Then I stitched on the elastic, folded, with the fabric sandwiched in the middle. I stretched the elastic while I stitched it down knowing how much I needed it to gather, less in the arms and a lot around the neck. I used a wide 3-way zigzag. 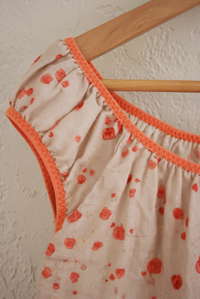 I did this all in one pass by machine, even easier than my tutorial for seam binding. The elastic comes with an indent down the middle for easy folding. There is a shiny disco/ice skating costume side and a dull side, I opted for the dull side on this top. I am in love with this stuff. Even on the dull side there is a glittery sheen which is slightly gaudy, but it's still wonderful and comes in a million colors, and is way cheap, so what's not to love? I plan to use it a whole ton for all kinds of things. It's really popular as a way to finish the edges of sewn diaper covers, but not this exact kind, a thicker type is used for that. 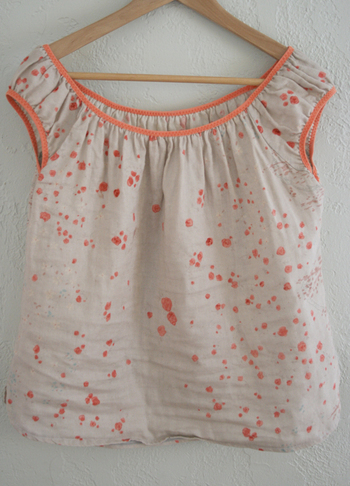 The fabric: Nani Iro Double gauze. I'm not finding this exact pattern readily right now, but a google search will get you some patterns similar. I have used this double gauze for a few garments and although I love the way it looks, I am not a huge fan of the drape. It's pretty clingy and is so light it just sort of sticks to my body. Hard to explain. I think a linen or a cotton knit would be a better choice. 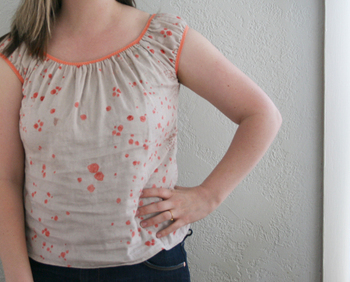 The blouse pattern: McCall's #4685 pretty altered, but it's where I started from. It's view D without the buttons or the elastic around my empty baby house. Fold over elastic: From Sewanne's. All these color choices make me so happy. She also has some great fabrics too, so look around.